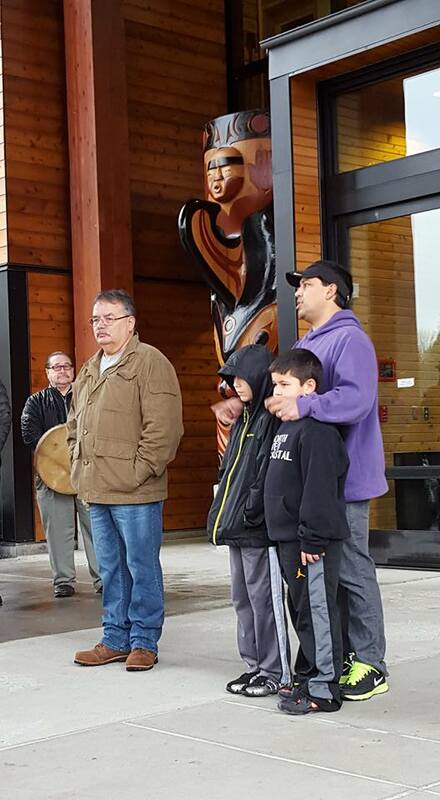 Tulalip Master Carvers Joe Gobin and James Madison and sons. These strong words by James Madison were spoken by his grandfather, Frank Madison, before him. And that is the message Madison wishes to convey to the next generation of Native youth, keep us alive. 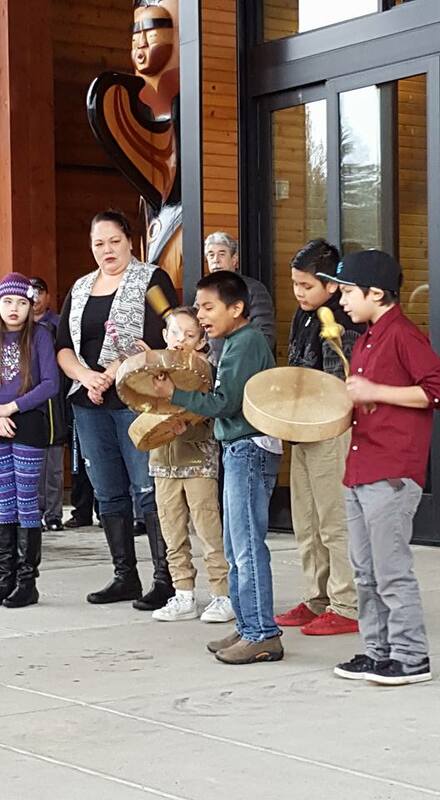 Maintaining our culture is of the upmost importance to Indigenous communities like Tulalip. 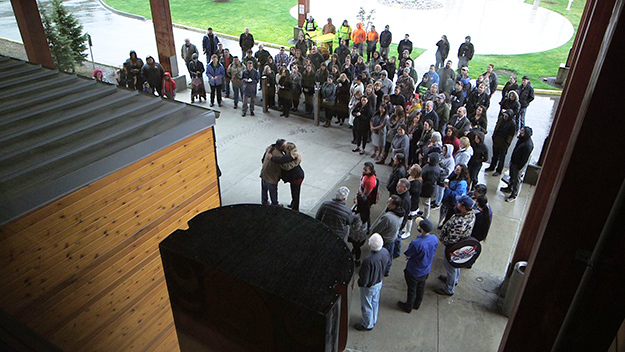 On March 7, Tulalip tribal leaders, tribal members and tribal employees gathered outside the Tulalip Administration Building to welcome two beautiful new story poles, one featuring an orca, the other an octpous, that take position outside the entrance to the building. 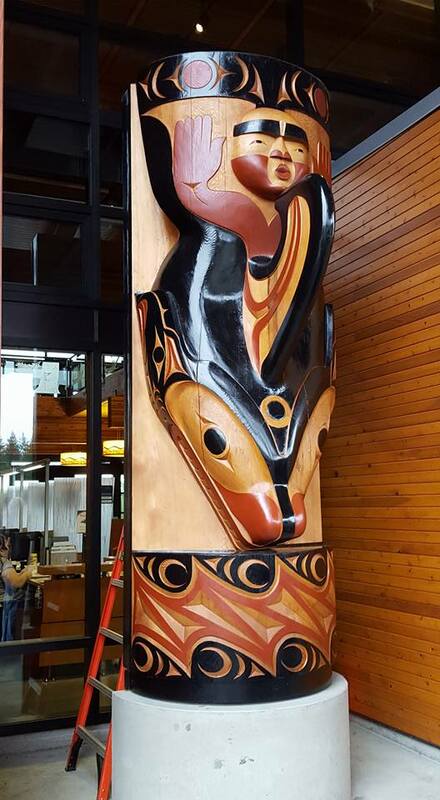 The poles, made from red cedar, were created by Tulalip master carvers, Joe Gobin and James Madison. Orca pole created by Joe Gobin. Octopus pole created by James Madison. The unveiling of the poles began with a prayer followed by singing and drumming. Gobin and Madison then shared the meaning of the poles. Gobin, who carved the Orca pole, explains that, “we’re killer whale people. The person on top is our spirit of the whale.” The eagle design represents the eagles that watch over our gatherings. The octopus pole features a diving rock. This represents the power of the Native people. Madison’s grandfather told stories of this water power, and how they would jump into the water with a diving rock and get water power for protection. Madison, with a hand on the shoulder of each his two sons, spoke of how proud his grandfather is for us putting our culture into our tribal buildings. Tulalip tribal drummers and singers. 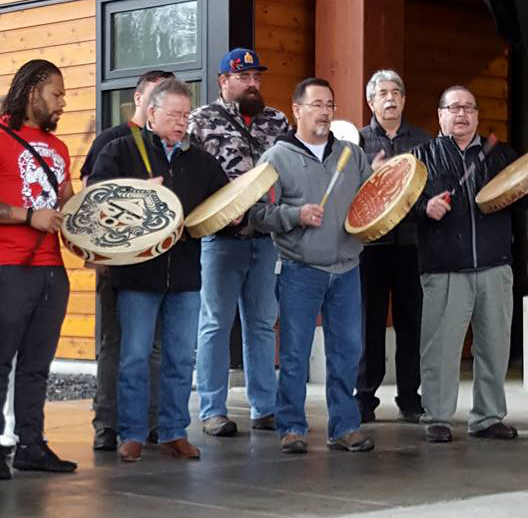 Tulalip Tribal Chairman Mel Sheldon and various tribal board members gave thanks to the artists and the art work, while emphasizing the importance of the teachings being passed on. Wrapping up the unveiling was a singing and drumming performance by Quil Ceda Elementary students. Crowd gathered at the Tulalip Administration Building for the totem pole unveiling. 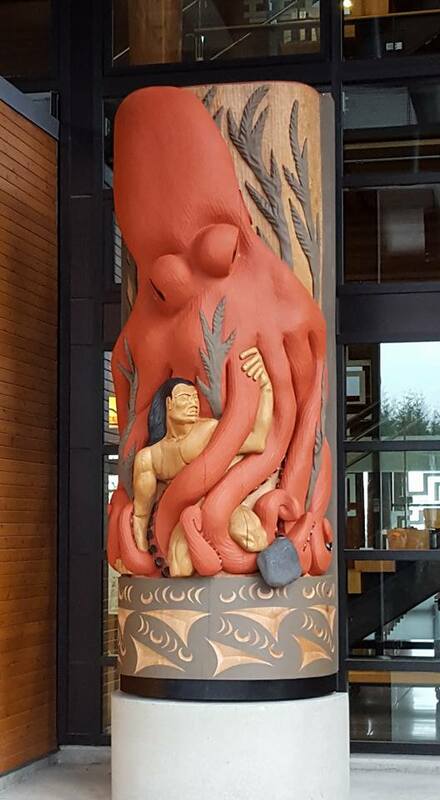 This entry was posted in Local News, Tulalip News and tagged culture, James Madison, Joe Gobin, story poles, totem poles, Tulalip Tribes by Kim Kalliber. Bookmark the permalink.